The Nestlé shareholder meeting on 6 April appointed a new board of directors under the Chairmanship of Paul Bulcke, formerly the Chief Executive Officer. Mark Schneider was appointed as new CEO in January 2017. Baby Milk Action/IBFAN-UK will be writing to the new administration on behalf of the International Baby Food Action Network (IBFAN) to ask this administration to accept IBFAN’s four-point plan to bring baby food marketing requirements into line with international standards, which would lead to the end of the long-running Nestlé boycott if the company met its obligations. 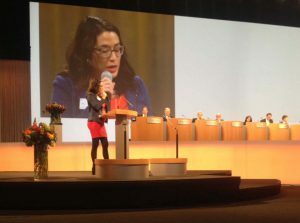 The need to change direction was also raised at the shareholder meeting by Camille Selleger, Human Rights Programme Officer, at Swiss-based IBFAN-GIFA. Ms Selleger appealed to Mr Schneider to market the company’s products in accordance with international marketing requirements. IBFAN is not calling for Nestlé to stop selling breastmilk substitutes, but to abide by the rules adopted by the UN World Health Assembly, to stop misleading families and to provide parents who do use formula with correct information on labels. Click here for the text of her intervention. The previous administration repeatedly rejected the four-point plan, while acknowledging that 90% of the violations of the international marketing standards reported by IBFAN were in line with Nestlé’s own policies. At past shareholder meetings, the Chair repeatedly defended promoting infant formula with strategies such as logos on labels claiming “protects” babies, despite knowing that babies fed on breastmilk substitutes are more likely to become sick than breastfed babies and, in conditions of poverty, more likely to die. According to the Lancet Breastfeeding Series, published in 2016, 823,000 babies die every year because they were not optimally breastfed. Nestlé increasingly targets pregnant women and new mothers through social media and by attempting to sponsor health workers, while seeking their endorsement for products using health and nutrition claims for products, which are often unsubstantiated. “We look on this as a new beginning for Nestlé. Although many of the people in the administration are the same, we hope that Mark Schneider as new CEO will finally agree that it is both right and wise to market baby milks responsibly. If more babies were breastfed, if instructions on powdered formula warned it is not sterile, then lives would be saved. Nestlé was voted the “least ethical company” of the past 25 years in 2015 and has many other shaming awards, so a change of direction could change its reputation. The International Code of Marketing of Breastmilk Substitutes and subsequent, relevant Resolutions of the World Health Assembly set out how products such as infant formula, follow-on formula and milks for older babies should be marketed. The Code and Resolutions aim to protect breastfeeding and ensure that breastmilk substitutes are used safely if necessary. The Nestlé Policy and Instructions for Implementation of the WHO International Code of Marketing of Breast-milk Substitutes are weaker than the Code, permitting 90% of the violations of the Code and Resolutions reported by IBFAN, according to the company’s own assessment. Its strategies undermine breastfeeding and mislead families who use formula. Nestlé also fails to warn on labels that powdered formula is not sterile and should be mixed with water above 70 deg. C to kill any pathogens that may exist in the tin. As FTSE4Good assesses companies against their own policies, Nestlé changed its own policy to permit promotion of infant formula brands through products for older babies. Identically branded milks for babies over one year of age are now widely advertised with misleading claims for unproven claims of benefits. According to the World Health Organisation the milks for older babies are unnecessary. For Mike Brady’s reflections on how the retiring Chair led Nestlé to be viewed as the “least ethical company of the last 25 years”, click here.